Swift by name; swift by nature. 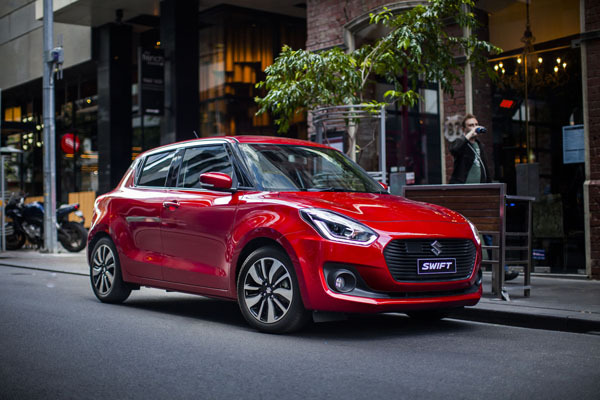 In automotive terms, it has taken just 12 years and five million sales worldwide for the Suzuki Swift to become something of an icon in the light-car segment. From the road up, the development team went to work, introducing a new-generation platform and engineering a completely new chassis, body structure and powertrain. 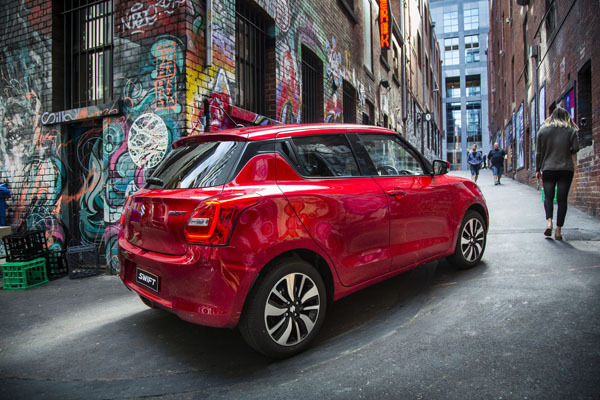 The new Swift comes to Australia in four variants, with the entry-level Swift GL 1.2 manual selling for $16,990 driveaway, adding a CVT for $1000, a Safety Pack for a further $1200, topping off the range with the Swift GLX 1.0 Turbo automatic at $22,990. I spent time with the Swift 1.0 GLX Turbo auto in Mineral Grey with Super Black roof. Suzuki designers and engineers were told to go to work on the Swift from the road up, making use of the latest structural techniques, automotive technology and modern looks without straying from traditional Swift characteristics. In keeping with modern small passenger car Swift has taken on a more assertive look, especially up front with a wide open radiator and lower bumper grille making a more aggressive statement. Fenders add more muscle to a lower and wider stance, while blacked out pillars give the impression of a floating roof and lower centre of gravity. Rear door handles ‘hidden’ in the C-pillar again follow the modern design trend without taking too much away for the Swift character. Our GLX Turbo rides on 16-inch polished alloy wheels with low rolling resistance in keeping with its sporty nature. One way the Swift goes against the segment trend is the fact that it is shorter than the previous model, while at the same time adding 20 mm to the wheelbase, opening up the cabin space. In keeping with a lower overall vehicle height, lowering the seating maintains adequate head room and added lateral space for the rear seats. The front seats have been separated by a further 10mm, creating more room between driver and passenger. At 50 mm longer, the new Swift has a reasonable 242 litres of luggage space, 32 litres more than the previous model. A 7-inch four-zone touch screen, situated at driver’s eye level on the central dashboard, enables easy access to audio and video playback and hands-free phone and navigation. Thanks to Apple CarPlay and Android Auto, the driver can also connect a smartphone. The 1.0 Boosterjet engine makes use of direct injection and turbocharging to give it performance and fuel consumption better than you would expect of its 998 cc capacity. The GLX Turbo has the engine mated with a six-speed automatic transmission incorporating an integrated cooler to improve fluid cooling. As well as six airbags, LED headlamps and daytime running lights, the Swift 1.0 GLX Turbo boasts a suite of safety measures rare in a vehicle in the light passenger segment. 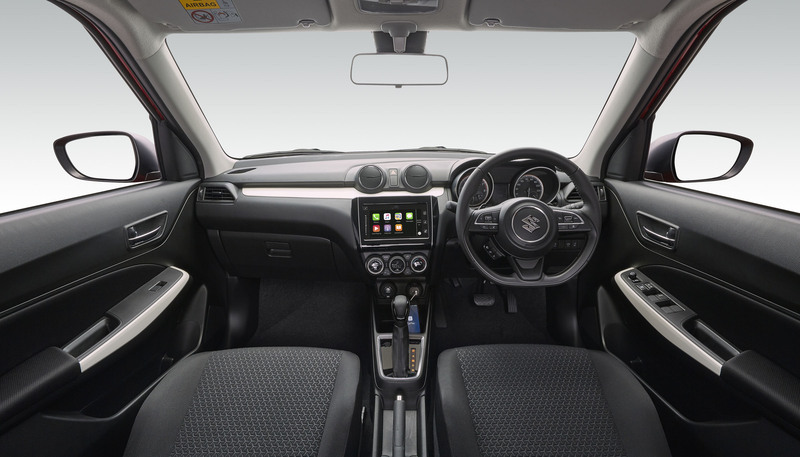 This includes Suzuki’s first application of a forward detection system which uses a camera and laser attached to the windscreen to look out for and warn, through the multi-information display on the dash of potential trouble ahead. Collision mitigation is in the hands of anti-skid braking with brake assist and emergency brake-force distribution. Warning systems such as lane departure warning, weaving alert, adaptive cruise control and high beam assist keep inattentive drivers alive. A flat-bottom steering wheel gives the driver the sense of being in a premium sports machine. Swift GLX 1.0 Turbo automatic offers both very good acceleration standstill and lower fuel consumption at cruising speeds. Engineers looked to Europe for Swift nimbleness and agility from a new-generation platform and suspension. For example, a new underbody, 30kg lighter than the one it replaces, contributes to lower fuel consumption and better performance in terms of acceleration, turning and stopping. There’s more room for passengers in a quieter cabin and more luggage space. Manoeuvrability has been improved with a reduced turning circle of 9.6 m. Steering has been sharpened with a newly designed, light and highly rigid suspension and is able to follow contours in the road but does pick up bumps and share them equally among all occupants. Large glassed areas all round make for a bright interior, wide views for passengers and the expansive rear window fills the whole of the interior rear-view mirror giving the driver, together with reversing camera, a safe indication of what’s behind. Both visual and audible warnings of danger contribute to the safety of driver and passengers but can be none-the-less intrusive to quiet conversation and generally relaxed atmosphere of a pleasant drive. On our time together, the Swift 1.0 Turbo recorded fuel consumption of up to 5.8 litres per 100 kilometres on a mix of city and country driving. This Suzuki Swift range-topper illustrates the advantage of modern turbocharging technology in producing performance with fuel economy. While the price is in the upper reaches of the segment the high specification justifies the outlay.